ISHINOMAKI, Miyagi Pref. - It’s a relatively minor incident that gets me. I’m at a gymnasium in central Ishinomaki photographing members of Japan’s Ground Self-Defense Force (GSDF) as they unload dozens of corpses from a truck. Each is wrapped in blankets, some with flowery designs far too cheerful for this occasion. There is only one stretcher available, so the process is painfully slow. The bodies are trundled away one by one past forlorn racks of volleyballs and basketballs and a reception area for surviving family members of those killed who had been brought to a makeshift morgue in the large hall. Inside, around 200 bodies have been cleaned, identified and lined up in neat rows then covered from head to toe with crisp white sheets. As the body of one elderly man is lifted by GSDF members, whose job of searching for the thousands who perished in the March 11 megaquake and tsunami must rank as one of the world’s worst, a shoe falls, exposing a mud-caked woolly sock and a white, grimy ankle. One of the GSDF men, wearing a face mask and rubber gloves, gently replaces it, but I cannot bear the pathos of the scene. My knees turn to jelly and the grief and exhaustion that have slowly built up over the past three days documenting this disaster push me past the stoicism threshold. The man was a resident of Ishinomaki’s Hiyorigaoka district, a seafront community that in this city of 162,882 people bore the brunt of the mountainous tsunami that hit Japan’s northeast coastline on March 11 following the magnitude 9 megaquake. Hiyorigaoka was one of hundreds of similar communities along the coast that were leveled, taking thousands of lives. Later I visit that district, surveying it first from atop a neighboring hill, home to a leafy park and quaint houses completely and quite incongruously untouched by the disaster that created the battered and burned landscape below. In the distance to the right are the smoldering remains of what appear to be storage buildings, while straight ahead are just a few buildings left standing. Otherwise there is nothing but debris. Down below, shattered homes have been crushed against the sides of the hill, in some places leaving piles of wreckage several meters high. Mixed with the smell of smoldering embers is that of gasoline mingled with seawater and sand; it’s a vapor which burns the throat and nauseates. The ground is a marshland of sludge, into which are embedded the remnants of people’s lives: photos of a children’s party; a rice cooker; pots and pans; a yacht that has come to rest in what was possibly someone’s front room. There is also the body of a man, slumped over the foundations of a home, gray sludge matting his balding head and clothes. His forehead rests on a wooden beam, and with his arms draped either side he looks as though he might awake from a TV- and green tea-induced siesta at any moment. Above me, the sounds of SDF helicopters scouring the land for signs of life merge with the blaring of sirens, which I now seem to hear even when there are no patrol cars or ambulances to be seen. 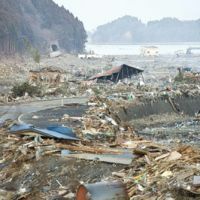 I have witnessed the destruction caused by quakes and tsunami before — I was in Sri Lanka just after the Indian Ocean Tsunami struck in 2004, and went to Niigata Prefecture in 2004 and 2007 — but I have never before set eyes on such a lethal combination of the two. However, having left for Sendai, Miyagi Prefecture, early on the Saturday morning of March 12, I had not yet seen any of the footage and images that were released immediately after. Not that it would have mattered. Nothing can prepare you for this. On the drive up there on a highway eerily devoid of life, I had spent a night in Iwaki, a medium-size regional city in Fukushima Prefecture that had been turned into a ghost town by the previous day’s events. Along the battered waterfront area, where tsunami-tossed boats and cars littered the roads, an elderly lady zigzagged her way along the main road past upturned vehicles, fridges, and other mangled detrius of a time before. Just then, a police patrol car urged the few people who had ventured outdoors to go back inside: Another tsunami is on its way, the officers warned through their speaker. There, though, the greater concern was the Fukushima Daiichi nuclear power plant located just 35 km further up the coast. At a refuge shelter in central Iwaki, I saw a tearful woman covering her face in despair as she listened to a portable radio reporting the earlier, first explosion at the plant. Her young daughter slept beside her, awakening only when another sizable temblor jolted the hall. After a restless night in Iwaki, I went on to Sendai, the capital of Miyagi Prefecture and the city said to be hardest hit by the megaquake. Oddly, the central part of the city looked relatively unaffected, but a trip down to the seafront revealed the true scale of the damage. There were trucks and cars everywhere, many upturned and mangled. One vehicle in particular stood out: the orange carriage of a train, which lay battered and on its side, the interior filled with limbs of trees, boxes, and who knows what else. Next door an elderly couple peered inside their home, which had been carved in two by the ravaging waves of the tsunami. The nearest train station, they said, is several kilometers away. “We have no idea where the carriage came from,” said Isamu Higuchi, 70, as he and his wife, Rie, 73, cleared away a mass of debris that had ended up on their property. “There used to be a 6-meter-long container where that carriage is now and we have no idea where that has gone either,” they told me. But it had gone and, like so many belongings here, most were likely never to be returned. According to resident Akio Nishizawa, an economics professor at the city’s Tohoku University who I bumped into, the chances of many of the flattened communities along the coast and around the Oshika Peninsula becoming ghost towns is high. One of those communities is Minamisanriku, a town of 17,666 people of whom some 10,000 are reported to be missing. The devastation there is staggering. Simply put, there is nothing left of this town that once boasted a thriving fishing and tourism industry — nothing except one gutted concrete waterfront building that leans threateningly. The end of my time in the region is marked by a much-needed story of hope. Among the ruins back in Ishinomaki I am accosted by a bespectacled, middle-aged lady dressed in a blue surgeon’s apron and rubber boots. Yoko Nasa leads me across the most incredible site of devastation imaginable, to first point to where she had found the body of an elderly lady “crying tears of blood” in the rubble, and then to her husband’s relatively undamaged gynecology clinic. “Here, at 2.46 p.m. on March 11, just as the quake hit,” she says, “a baby boy was born.” What’s more, mother and child survived the quake and the subsequent tsunami.